A readily portable miniature microscope weighing less than 2 grams and tiny enough to balance on your fingertip has been developed by Stanford University researchers. The scope is designed to see fluorescent markers, such as dyes, commonly used by medical and biological researchers studying the brains of mice. The new device has no moving parts that would require realignment if the scope gets jostled and, aside from the outer lens, it is sealed against dust, making it well suited for use outside the lab. Up to now, such work typically had to be done in a laboratory, using desktop microscopes. "You could put 10 of these in your pocket and take them out to the field to do ecological studies of soil or give them to aid workers to carry, so they could potentially do on-the-spot medical screening for diseases such as tuberculosis," said Mark Schnitzer, associate professor of biology and of applied physics at Stanford. "This opens up possibilities for using microscopes where you just wouldn't dream of taking them today," Schnitzer said. 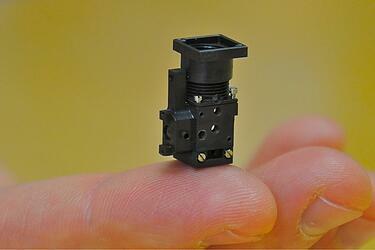 The miniature microscope weighs in at 1.9 grams and is a towering three-quarters of an inch tall. The image is displayed on a computer – wherever you can take a laptop, you can use the microscope. The device was built using readily available technology. Many of the components were originally developed for cell phones and other consumer devices. All the parts could be readily mass-produced, which could make them inexpensive. Compared to a small, high-resolution fiberoptic microscope developed in Schnitzer's lab in 2008 – the state of the miniaturized microscope art until now – the new device offers a field of view seven times greater and reduces degradation of the image by a factor of five. It has improved optical sensitivity, higher resolution and far greater portability than either fiberoptic or conventional desktop-size microscopes. "Usually when people miniaturize things, the performance is not as good as the conventional-sized device, because you've constrained everything so much," said Abbas El Gamal, professor of electrical engineering. He and Schnitzer describe the research in a paper published online this week in Nature Methods. The researchers have used the microscope to detect tuberculosis in cells cultured in the lab. They also have used an array of four of the devices in experiments counting individual cells cultured in the laboratory and achieved accuracy comparable to that obtained with standard full-size cell counting equipment. And they have demonstrated that the microscopes may also have utility for screening for some genetic mutations. The researchers were able to distinguish mutant zebra fish from those lacking the mutation by comparing images of certain nerves. The research was a collaboration. Schnitzer's research group had been working on imaging active neural circuitry in the brains of freely moving mice for a while. But the fiberoptic setup they had been using was too restrictive and they wanted to develop a device that would allow a mouse more freedom of movement and record information from greater numbers of neurons using high-speed fluorescence brain imaging. El Gamal's research group had been mainly focused on designing custom imaging sensor chips for various applications, and when the two groups began working together they initially expected to develop and use a new custom chip, but they ended up deciding against that approach. "In engineering, we usually try to advance the state of technology by building something on the cutting edge, a prototype to prove a concept works," El Gamal said. "But in this case we decided that if it doesn't actually work in animals, then it has no value. So we chose to build a system rather than a new chip." As Schnitzer noted, when you decide to put together a high-performance, tiny microscope that can be mounted on the head of a mouse and record about 100 frames per second of high-resolution video of brain activity, you're putting yourself under a lot of constraints. "There are so many things to tweak, you could never prototype them all," Schnitzer said. So graduate students Kunal Ghosh of electrical engineering, Laurie Burns of applied physics and Eric Cocker of mechanical engineering developed a virtual way to test potential combinations of parts in a computer simulation before spending the time and effort to assemble them. The final product worked right off the bat, with the predicted level of performance. "We are already using it to get cutting-edge data," Schnitzer said. "You can really see what is going on under the hood now." Schnitzer's group has been studying an area of the mouse brain involved in coordinating the hind and fore limbs during movement. By not using fiberoptics to connect the microscope to a computer, the team was able go with an extremely thin set of wires – the kind used in hearing aids – giving the mouse much more mobility. With the combination of more mobility, wider field of view and better resolution, the researchers have witnessed neurons firing simultaneously in bands of up to 30 neurons as the mouse moves, a pattern never observed before. It is a pattern that Schnitzer said only appears when an animal is actively moving. "This microscope is going to be important not only for improving our basic understanding of how the neural system works, but also for looking at how some of those forms of activity may go awry in some brain diseases," Schnitzer said. The current limit to its image resolution is 2.5 microns, or 2.5 millionths of a meter, but just by using state-of-the-art cell phone imagers, that could be improved to 1 micron, El Gamal said. Ghosh, Burns and Cocker are all co-authors of the Nature Methods paper. Axel Nimmerjahn, a former postdoctoral researcher in the Schnitzer lab, and Yaniv Ziv, a postdoctoral researcher in Schnitzer's lab, also contributed to the research and are coauthors. Funding for the research came from Lawrence Livermore National Laboratory; the Office of Naval Research; the National Institutes of Health; the National Science Foundation; the Packard, Bill and Melinda Gates, and Paul G. Allen Family foundations; and the CNC Program at Stanford (funded by the president and provost of Stanford through the BioX and NeuroVentures programs, and supported by the Stanford Institute for Neuro-Innovation and Translational Neurosciences).